LPN vs RN, What’s the Difference? Before enrolling in an LPN course, learners must ensure that their selected program meets their state’s LPN licensing and training requirements. A list of approved in-state programs can be found on each respective state’s Board of Nursing website. Often requirements to be state-approved involve programs ensuring that their instructors are also licensed. They also must be comprised of an extensive curriculum, combining classroom learning which clinical laboratory experience. After completion of a program, Licensed Practical Nurses must also pass the National Council Licensure Examination for Practical Nurses (NCLEX-PN). Even after passing LPNs will be subjected to a potential employer’s screening process which often includes a fingerprint-based background check prior to being hired. During a typical day at work, a Licensed Practice Nurse can expect to administer medication to patients, including oral and sublingual, subcutaneous, intramuscular, and intradermal injections, eye drops, ear drops and topical treatments. They may also administer breathing treatments, clean wounds, perform dressing changes, monitor IV and injection sites and make sure all patient needs are addressed. Grube added that she will oversee up to six CNA’s at a time to ensure that they are completing their own responsibilities. She added that her days also consist of participating in care plan meetings and stand-up reports, which has representatives from every department involved in the patient’s care at the facility. These representatives include Social Workers, Recreational Therapists, Occupational Therapists, Speech-Language Pathologists, Dietitians and Physical Therapists. Obtaining the proper education is your first step toward becoming a Registered Nurse. To enter a nursing career as an RN, students must first graduate from an accredited program to receive either a nursing diploma, associate degree or bachelor’s degree. Check out this expert guide on gaining admittance into nursing school! 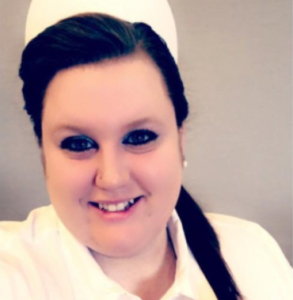 “How I went about selecting my RN program was based on a few different things: I wanted to go to a program that had a successful first-time pass-rate, a heavy alumni-connection to benefit me during my employment search and a strong overall learning environment,” Ashley Gilman RN, a Registered Nurse practicing in Pennsylvania, explained. Once this educational requirement has been fulfilled, prospective RNs must pass the NCLEX-RN examination which usually takes about six hours and is comprised of more than 100 questions. The final step prior to gaining employment is to obtain a license in the state which the professional intends to practice in. In a career in healthcare as a Registered Nurse, these professionals treat patients with illnesses, injuries and medical conditions, and are able to perform all of the same skills as a Licensed Practical Nurse and more. Registered Nurses can also support Physicians in providing treatment to patients suffering from various medical conditions. They also monitor patients, educate patients on best practices, work to develop long-term relationships with patients and help coordinate doctors’ and surgery appointments. Unlike LPNs, RNs can also administer IVs, perform BLS (Basic Life Support), ACLS (Advanced Cardiac Life Support) and Pediatric Advanced Life Support (PALS) and admit or discharging patients safely and as appropriate. They may also insert and manage intravenous catheters and intraurethral catheters. Furthermore, those Registered Nurses with advanced education may be tasked with performing case management and patient diagnosis. Furthermore, “as a Registered Nurse, one of the main responsibilities is knowing your patient, what is their ‘normal’, and being able to realize clinical changes that are happening that stray from their baseline. Advocating for your patient and letting someone know that something isn’t normal is also really important,” Gilman shared. What really separates the role of an RN from that of an LPN is the expectancy of a Registered Nurse to supervise Licensed Practical Nurses, Certified Nursing Assistants and Aides. By law, Registered Nurses are required to oversee LPNs. In a supervisory position, Registered Nurses must maintain accurate records and ensure that all protocols and expected methodologies are completed as required. They must also ensure that their staff LPNs and CNAs are aware of their daily responsibilities and instruction, and that they are fully equipped to carry out their expected tasks and rounds. Overall, RNs are responsible for all LPN duties as well as RN duties. Whereas Registered Nurses must attend school for two or three years to receive an associate’s degree, LPN programs last only 12 to 18 months. As the title implies, Licensed Practical Nurses are tasked with the “practical work,” while Registered Nurses are able to provide more in-depth assistance due to their associate’s or bachelor’s degree in nursing and license. For these reasons, being an RN also comes with an increased wage. A Registered Nurse tends to complete more assessments and treatments which require greater critical thinking and responsibility than a LPN. This is because Registered Nurses have more extensive knowledge stemming from more rigorous educational requirements. Many LVNs go onto obtain an RN qualification. There are many schools that offer an RN bridge program which typically takes about a year. Note that entrance requirements for RNs and LPNs school vary significantly by state and by school, however, in general LPN applicants need a high school diploma or GED with a 2.0 GPA and sometimes, basic anatomy/physiology courses. LPN course typically last one year. RN students may need a higher GPA average (2.5) and separate college level courses in anatomy, physiology and frequently chemistry. Most RN programs end in either an associate or bachelor’s degree with their own general educational requirements and will take 2 to 4 years to complete. Although you may be able to find an LPN class with minimal entrance requirements, many of the LPN programs with more entrance requirements are gearing their students to advance their nursing career by easing a future transition from LPN to RN.